Most of the tourists coming to Bhutan seek out a unique experience and the majority of the tourists come specifically so as to immerse themselves completely in the Bhutan experience. The word “happiness” has become synonymous to Bhutan for the rest of the world and we are here to share this happiness that the Bhutanese spread through our Bhutan vacation plan. Upon arrival, you're met by your private guide at the airport and driven to your hotel by private transfer. After check-in, take some time to relax and recover from the long flight. Your local guide will show you around the anarchic metropolis of Kathmandu. Starting off in Durbar Square, make your way to the market quarter on Thamel as well as the House of the Living Goddess before you explore some of the more eccentric areas that you would only discover with a local. This morning, you’ll be driven to Kathmandu airport for your short one and a half hour flight to Paro. Upon arrival, you’ll meet your private guide who will stay with you for the rest of the trip. As per your personal preferences, he can suggest some good stops along the way. En route the one and a half hour drive from Paro airport to Thimpu, you can stop at Simtokha village. The road into Thimpu closely follows the Paro Chhu river with picturesque views back across the Paro valley. The capital of Bhutan, Thimphu, welcomes a number of visitors every year. Touring this beautiful city is quite convenient and is also the most visited city in the country. It is like a treat to visit Thimphu. The city is situated at an altitude of 2334 m above sea level, thus making the weather conditions very pleasant throughout the year. There are a number of activities that one can do here in Thimphu along with enjoying the scenery the city has to offer and thus, the city is the dream of every traveler and adventure junkie. Trekking, which is considered to be the best way to explore nature in its truest sense, is amongst the most popular activity here. Today, you have the entire day to discover Thimpu with your guide. The city is best explored on foot, though your driver is on hand in case you wish to visit one of the sites of interest situated on the surrounding hills. The King's Memorial which is built in honor of the third king is of particular interest. Each day a number of Bhutanese come to pray and spin the lively prayer wheels - it's an amazing spot to people watch. Continue your journey by road this morning to Trashigang. The drive will take most of your day but you will have the opportunity to stop in between and soak in the scenery along the way. Check in to your hotel in Trashigang which sits peacefully above the Drangme Chhu River. 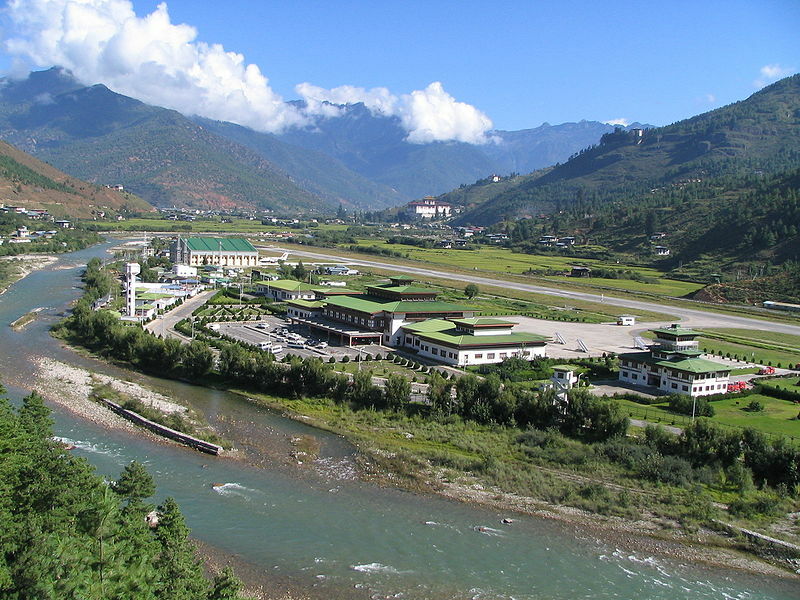 Trashigang is considered "The Jewel of the East", and spans the easternmost corners of the kingdom. It is the largest district of the country, with an altitude that ranges from 600 m to over 4000 m. The town is also used as the market place for the semi-nomadic people from Sakteng and Merak whose costumes are unique in Bhutan. Visit Gom Kora a temple which is filled with vibrant Buddhist carvings and Chorten Kora. Later in the afternoon, explore Trashigang which is packed with traditional wooden buildings as well as original architecture. Get ready today for a scenic drive to Punakha, over the Dochu La pass offering splendid views. The drive will take about 3 hours but it is worth stopping in between to visit the Chimi Lhakhang temple before you reach Punakha. The temple cannot be reached by road and so your guide will take you on a brief walk through rice paddies to the temple itself, an especially memorable way to arrive. On reaching Punakha, check in to your hotel and spend the remaining part of the day relaxing. 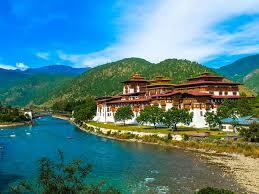 The Punakha Dzong is located on the confluence of the Mo and Pho river. Today your guide will show you around the temples, towers, and courtyards. Over the years, it has suffered from plenty of fires and flooding but is still one of the most stunning dzongs in Bhutan. Today, you’ll return back to Paro by road which will take about five hours. Your guide can suggest places along the way to stop and enjoy the scenery and some light refreshments. On reaching Paro, you have the remaining of the afternoon just to relax. Your hotel possesses an open-air terrace with incredible views right across the valley. Today, you’ll drive 12 km out of Paro to Taksang, famously known as Tiger's Nest Monastery. 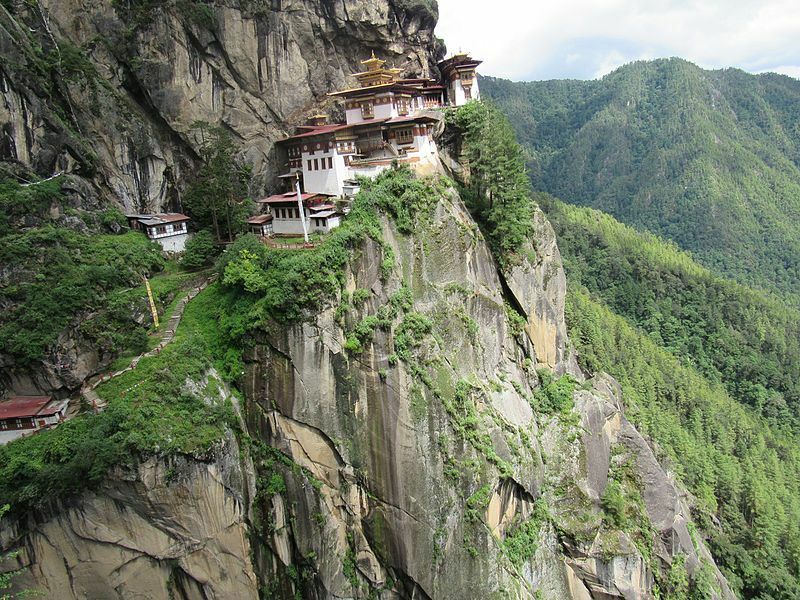 The monastery, which is the highlight of most Bhutan Trips, is perched on a high rocky ledge with splendid views. Depending on your fitness, the climb from the car park takes two to three hours with small cafes to stop off for some tea or coffee en route. Upon arrival at the hermitage itself, retrace your steps back to the car park. In case you feel like you might not be able to make it to the hermitage itself, a visit is still suggested to view the monastery from a viewpoint with a splendid vista of the cliff face. Today, spend your day at Cheli La, which is one of the highest passes in the area. Here your guide might walk you to some local villages for a taste of local life and also to admire the mountain views. This morning, you’ll be driven to the airport to catch the short flight back to Kathmandu. Upon arrival, you’ll meet your guide and driven to your hotel. You may have some time today to explore Kathmandu. Utilize this time by visiting the Thamel market for some quirky souvenirs shopping. Today you will be driven to Kathmandu airport by your guide for your onward flight back home.